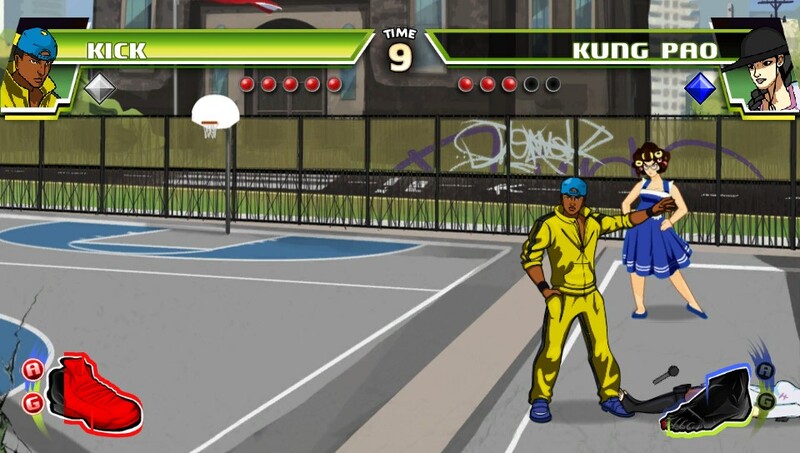 Divekick Review for PS3 and PS Vita! I tell you, I didn't know what to think of this game the first time I saw it. Was it for real? Two buttons? Diving and kicking? What fun could that be? How challenging would that ever be? I am sure glad I played it though... from a gameplay standpoint the technique is easy to pick up, but each battle can turn into a well-played game of chess. From a story line standpoint, the game definitely doesn't take itself seriously, and you will roll to hear the one-liners each character has and to see their back story revealed. Platforms: PSN, Vita, PC Steam (Steam version NOT reviewed here) Cross buy for PS3 and Vita! MSRP: $9.99 PS + for a couple of weeks for $7.99! One hit, one knock out. That's what you go into battle knowing, and it makes every move you make a completely thoughtful one. It takes a little while to get to know the "special" moves (instructions are hard to find in the menus, and even once you know how to do a move, knowing when to use it is not easy to realize). One button dives up, one button kicks you forward. 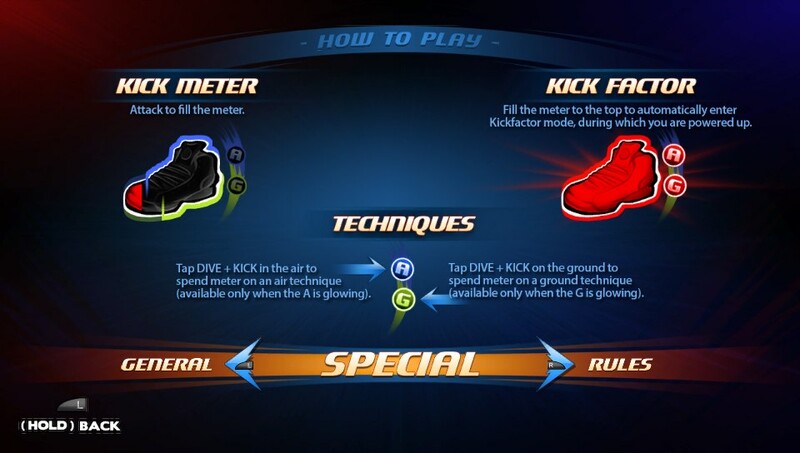 If you tap the kick button on the ground, you do a quick jump away from the opponent. Yes Kick is dropping a mike on Kung Pao. Each Divekicker has a slightly different technique. Some have a shallower angle of attack, some jump backwards first, some are faster, some jump higher, some electrocute your enemy (whu?!). Experiment with each one to see which fits your style the best. You can build up a kick meter (that little red foot in the screen above). When filled, you enter a bit of a rage mode, where you go faster, jump higher... it all depends on your character. 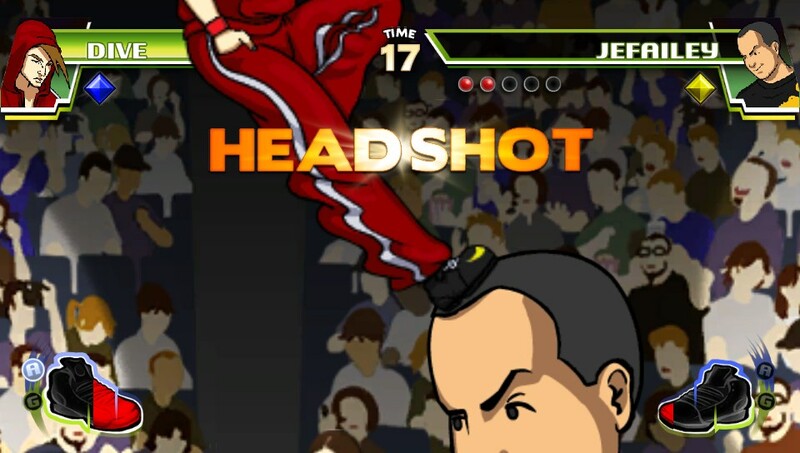 You can hit your opponent with a Headshot! This gets you one round win, same as a normal hit, but you begin the next round with an advantage. The opponent is "concussed" and they move slower and don't jump as well for a bit. Each character has a health bar. This seems normal, until you realize you die after only one hit EVERY time. Just another funny touch. 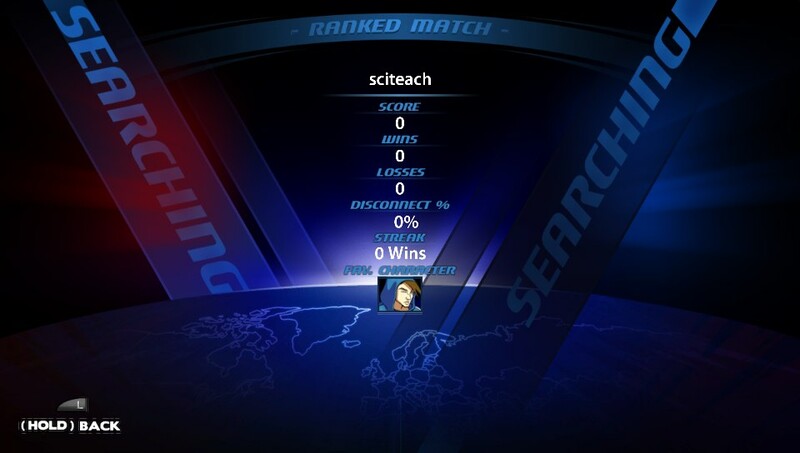 I played through many characters so far, and like "Markman" the most. He constructs a Kickbox controller and has throw attacks to disrupt your opponent. When the controller is complete, he has some other attack moves. Sounds bizarre... and it is! But it is a good deal of fun. Cheesy awesome. There is a classic fighting game vibe to the different levels you play on. Sometimes there's a kind of Karate Kid montage music feel to the battle. In the online lobby while you wait there is a cheesy elevator music in the background to a very cool wait screen. Perfect. Hearing the catch phrases of each character always cracks me up. Sure, Kung Pao is ridiculous when you shrieks out in classic Kung Fu-ey goodness. But I have a good laugh each time. Play the game on the single player story mode, you'll get a huge kick (hah!) out of each and every fighter's story... their reason for fighting...and their unique and hilarious catch-phrases. My first character I used was Dive. 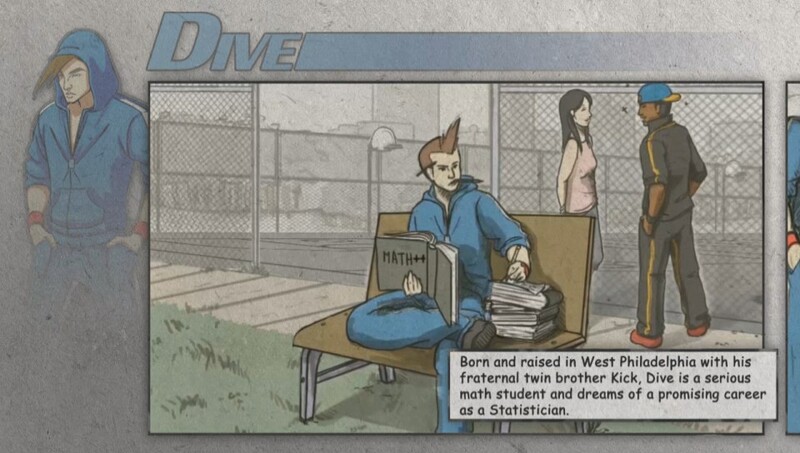 He and his fraternal twin brother, Kick, end up moving to Bel Air. Yes Kick looks and talks like the Fresh Prince. 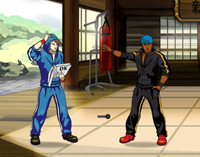 I just looked up the characters on the Divekick Wiki and there are some pretty funny parodies of other fighting game characters, styles, etc. Check it out. Some catch phrases when defeated: "Statistical anomaly!" and "Divide by zero!" Classic. The game really comes into its own when you begin challenging other players. I even played against my 6 year old son to test this part out. On the Vita. If you play this way, you share the same Vita, but each get two buttons. It's a little funky in that you have to share the handheld, but it was a hoot to play with him. And no, I didn't own him every time. 2D classic gaming graphics. Nothing fancy. But it feels like a Street Fighter kind of thing, and that's the point. The story is told in sliding panels with captions. The action of the actual game is simple, too. 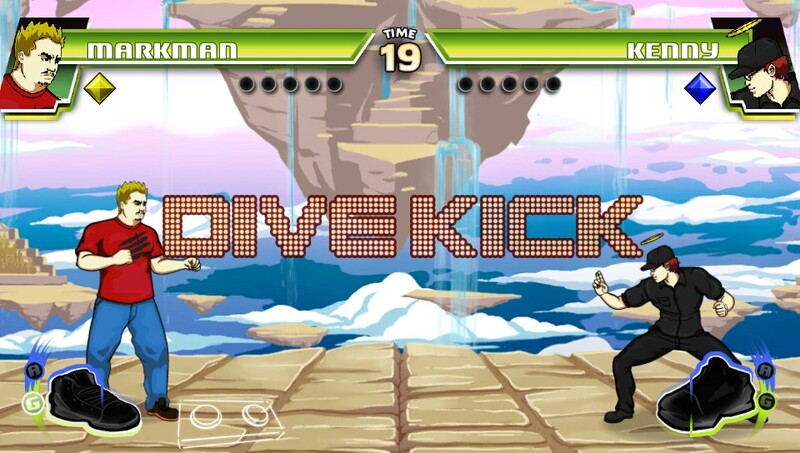 Each character has a few special moves, but nothing in a flashy manner on the screen. Colors are great and slick, models are fun. Solid graphics. you enjoy a quality fighting game that involves strategy, but not a lot of combo moves strung together. A fighting game that parodies fighting games...and wins. A strategic fighting game that is easy to pick up, difficult to master. (Just thought I'd throw in a cliche phrase to fit with the parodies in the game). 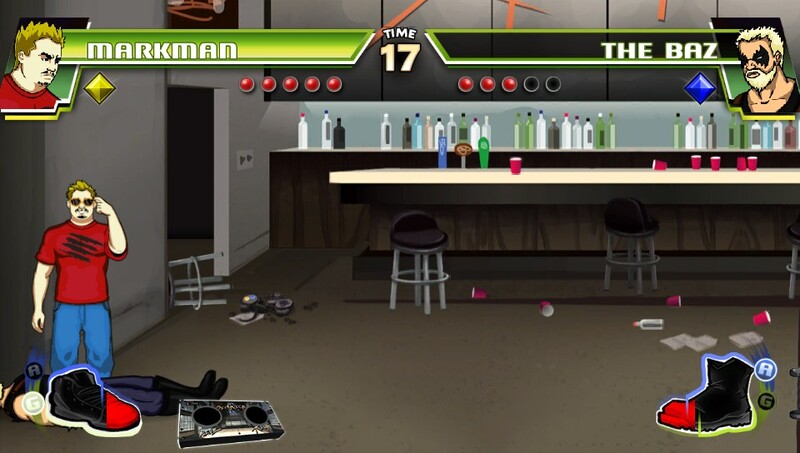 Comment below if you like fighting games and might give this a try!